Farum Park was built in 2000 to replace Nordsjælland’s old stadium that had stood at the same site. Farum Park was the first Danish top league club to install an artificial pitch at their stadium. This was done before the 2012/13 season. Farum Park is located toward the north-west of the small town of Farum. The walk from Farum’s train station takes about 15 minutes. Farum is easily reached from Copenhagen with the S Tog commuter trains. Farum is the last stop on line A and H, which can both be taken from Copenhagen’s main rail station. The journey takes about 38 minutes. If arriving by car from the direction of Copenhagen (16/O2), take exit 9 Faurm-C, and then the Paltholmvej west. Either follow the Paltholmvej to the end where there is a car park, or turn left onto the Gammelgårdsvej, right onto the Ryttergårdsvej, and follow until you see the main entrance of the stadium on your right. Tickets for FC Nordsjælland matches can be bought online, at the FCN Shop at Farum Park, or at the ticket windows of the stadium on the day of the match. 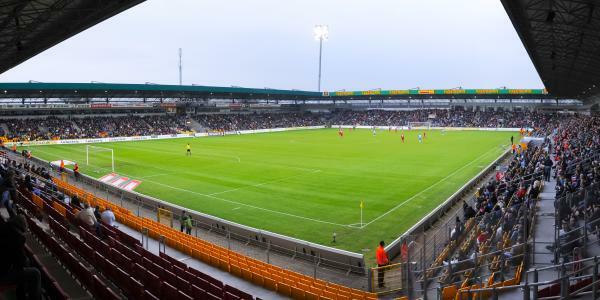 Nordsjælland normally rarely sells out, though recent successes have led to rising attendances. Tickets for all stands cost DKK 125.00, but are increased for three high-profile matches (FCK, Brøndby, and Lyngby) to DKK 175.00. Fcn.dk – Official website of FC Nordsjælland. Farumpark.dk – Official website of Farum Park.